The City of Chicago has chosen Studio ORD’s design to move forward with on its $8.5 billion expansion of O’Hare International Airport. The Studio ORD team consists of Chicago-based Studio Gang, STL Architects, Solomon Cordwell Buenz, Corgan Associates, and Millhouse Engineering & Construction. Chicago Mayor Rahm Emanuel and his administration’s Evaluation Committee made their choice just weeks before Emanuel’s tenure as Mayor will end. The focal point of O’Hare’s expansion is a new 2.25-million-sf global terminal that will replace Terminal 2 and make connections easier for passengers coming in from Terminals 1 and 3. The project is expected to break ground in 2023, according to the Chicago Tribune. The new Global Terminal will more than double the space in Terminal 2, with more room for additional gates, concessions, lounges, a new baggage system and improved security screening. In its contest submission, Studio ORD described its design for the three-part terminal as suggesting the confluence of the Chicago River, whose three “branches” converge into a central, wood-accented atrium space illuminated by a dramatic, six-point glass Oculus. The terminal’s roof is supported by Y-shaped columns that resemble trees, spaced over 100 ft apart. Beneath the Oculus, a “neighborhood” unfolds around an expansive central green that could support pop-up events, music, and informal gatherings. A light-filled mezzanine, for ticketing and security, offers passengers a view of the airfield. 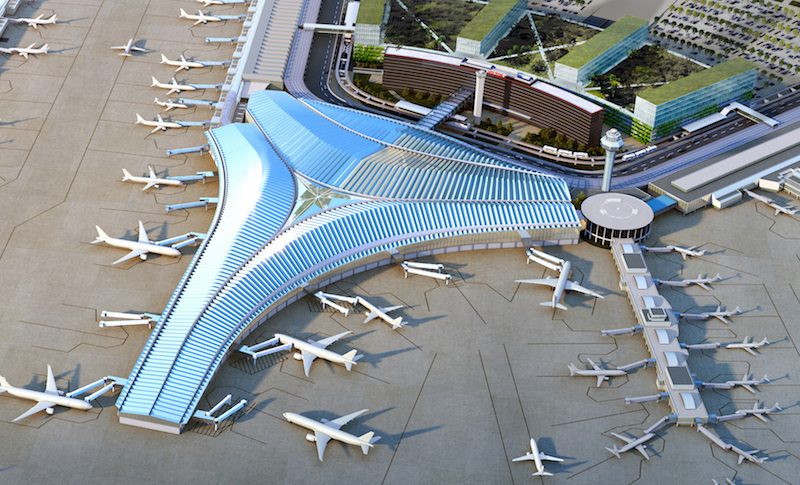 The design takes its inspiration from the airport’s original name—Orchard Field. The Tribune reports that while Studio ORD’s design won, its design finished third with the public during a week-long survey period that drew more than 41,200 responses, nearly one quarter of which from Chicago residents. The contract negotiated with Studio ORD does not require City Council approval.